As one of the staples of living, feeding ourselves has been surprisingly harder than it should be. I probably would have saved myself a lot of time and frustration if I’d hung around the kitchen long enough to learn a thing or two from my mom while she was cooking dinners growing up. Dinner preparations usually started right as back-to-back episodes of The Simpsons aired each night, and I couldn’t bear to miss a moment of my favorite show – priorities are priorities. Now that I’ve been out of my parents’ house and fending for myself for a few years, I’m finally figuring out some of the meal-making tricks of the trade and pitfalls to avoid that I missed during all those couch gags. 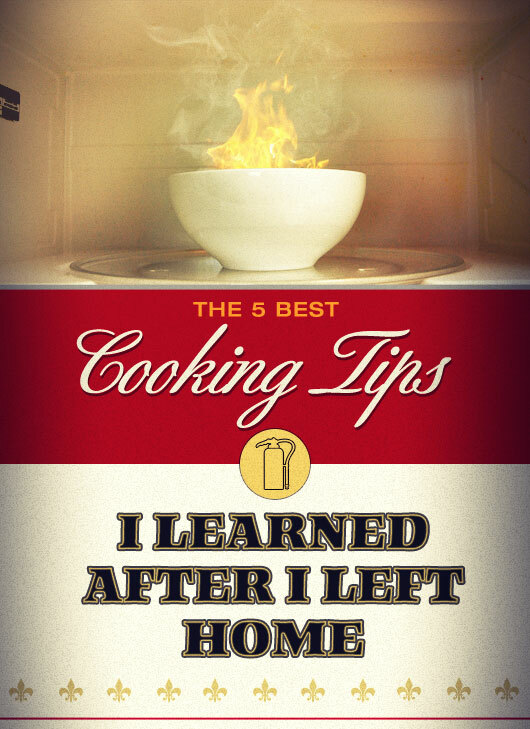 Luckily, my mom is still happy to dispense occasional words of wisdom and recipes when I need the help. Here’s a shocking revelation I had after I left home: food doesn’t materialize out of thin air – nor did the meals that appeared on the table every night growing up. Post-college, I quickly learned that having a fridge stocked only with a cup of yogurt, mustard, and a moldy lime meant I ate out or ordered in more than I could afford. Now that I’m fully responsible for my own care and feeding, I plan ahead by stocking my cabinets with long-lasting staples that can be used in a myriad of ways. I try to always have on hand rice, pasta, canned or dry beans, canned tomatoes, kosher salt, a couple different types of oil (olive and grapeseed, usually), spices (cumin, cayenne and paprika are some of my favorites as well as black pepper), onions, potatoes and garlic. My fridge almost always has eggs, butter, lemons, parsley and cheese – usually a good crumbly Parmigiano. Your go-to staples might be different than mine, but as long as you have an array of basic ingredients to pull from, you can easily make dozens of different meals, especially with the addition of a fresh vegetable and/or a cut of your favorite meat. 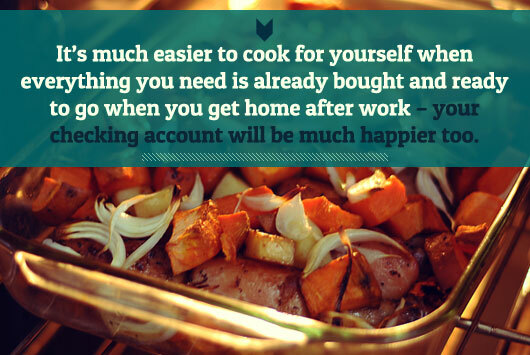 It’s much easier to cook for yourself when everything you need is already bought and ready to go when you get home after work – your checking account will be much happier too. When I’m hungry, I’m usually able to focus on just one thing: eating as soon as possible. That’s why food shopping is one of the most dangerous things I can do when famished – at least as far as my budget is concerned. If I’m starving while at the supermarket, I can’t resist the things I’m craving most in the moment – beef jerky, chips and dip, that huge tub of mint chocolate chip ice cream. I end up coming home with some tasty snacks but nothing with much nutritional value to speak of. That’s why I aim to shop after a meal, or at least before I become irrationally ravenous. I’ve also found that shopping with a list (compiled from a couple recipes I want to try that week) means my trips are more efficient and less impulsive – and less expensive. My mom calls it “mise en place”. I call it “read the whole recipe so you don’t have to run to the store for that one stupid egg you didn’t realize you needed halfway through”. Don’t start the first steps of the recipe until you’ve read through the last step. Don’t fall into the trap of figuring you probably have everything you need – take out each ingredient called for as well as the implements, bowls and pans you’ll need to make the dish. Bonus points if you pre-measure each ingredient, which makes completing the steps of the recipe that much quicker and less stressful. As an actor, I’m a big fan of rehearsal. The first recipe read-through is to make sure I understand all the steps and to do a mental run-through of the process. This is especially helpful when cooking quickly at high heats (like stir-frying in a wok) or with steps that have to be done in a very specific order (like combining dry and wet ingredients when baking or making pancakes). If you loathe cleaning up while in a blissful food coma as much as I do, start preemptively stacking bowls and utensils as you finish with them during cooking. If something needs to roast or simmer for more than a few minutes, set a timer and start tackling dirty dishes then and there. You’ll be so much happier after dinner when the kitchen’s already all tidied up and ready for your next endeavor. Brussels sprouts. Cauliflower. Spinach. Kale. Asparagus. Mushrooms. The kind of foods that were the obstacle you had to negotiate your way through to earn desert when you were young. Your parents may have boiled or steamed the life out of them. Maybe they were over-salted (or unsalted and bland). Or it may have just been your underdeveloped palate as a kid. Whatever happened at home growing up, drop your grudge and give the foods you thought you didn’t like another chance – you very well might have a completely different experience. Brussels sprouts can be out-of-this-world tasty if they’re pan fried with bacon or roasted with a generous sprinkling of smoked paprika and kosher salt. Cauliflower that seemed flavorless growing up is anything but when sauteed with olive oil and a mix of cumin, paprika and cayenne. Roast or broil veggies (potatoes, carrots, asparagus, broccoli, bell peppers, onion, whatever) that have been drizzled in olive oil and a little salt, letting them brown a bit but not so long that they’re burnt or too soft (keep a close eye on anything in the broiler – it’ll cook much faster than in the oven). Give the foods you thought you hated a do-over – they deserve another taste. Be fearless, be bold, try something new. This is one of those in-and-out-of-the-kitchen morsels of wisdom that I’m still trying to put into practice myself. Things might not turn out as you expected, but you’ll probably learn something – even if it’s what NOT to do next time you make that dish. Fortunately, when it comes to cooking, there’s almost always some wiggle room on either side of a measurement, temperature, or time. Leaving something in the oven a few minutes longer than the recipe says or adding a bit more of an ingredient than you intended usually isn’t a meal-breaker (the one exception might be salt – if you’re salting to taste, do so gradually and taste often so you don’t accidentally go overboard). Not everything’s going to turn out great, but I enjoy cooking for myself and others most when I go out of my comfort zone and try new things. I still depend largely on recipes for guidance and inspiration, but the more time I spend cooking in my kitchen, the more confidently I deviate from the instructions with my own twists and improvements. More often than not, the resulting meal is good enough to write home about. Liam Mulshine is a graduate of Boston University and works as an actor in Los Angeles. He’s an astronomy nerd, takes photos of everything, and is currently learning how to code with <i>mixed success</i>. You can find him on Twitter and via LiamMulshine.com. His (proud) mother – even when he doesn’t write or call – is Laura Kumin, creator of MotherWouldKnow, a blog full of recipes, cooking tips and bits of advice that Liam occasionally takes. I discovered my love for cooking about halfway through college. Back then it required going to a community dorm kitchen but I did it anyway. I mostly just taught myself, learning from online recipes, the food network. My mother taught me a thing or two as well. It is so much cheaper and healthier than eating out. Plus I usually have leftovers for work the next day so I don’t have to eat out then either. I pretty much always keep boneless, skinless chicken breats, chicken thighs or legs, as well as some ground chuck and pork loin in the house. My staples for vegetables are tomatoes, bell peppers, and fresh green beans, and occasionally mushrooms, along with pasta and spices of course. If you have the room, you should really consider getting some fresh herbs, like basil and parsley, and planting them. Home depot sells them for pretty cheap. You don’t realize the difference they make until you have them.